OM International Machine Tools is Manufacturer & Exporter of Hydraulic Hacksaw Machine & Cutting which is very effective machine for Cutting Operations in Workshops. Hydraulic Hacksaw & Cutting Machine Manufacturer is determined to produce super quality Cutting Machine in India at cheap prices and delivers them to Indian businesses and also availing the same to export outside India. We feel proud to introduce ourselves as one of the well-known manufacturers and suppliers of Hydraulic Hacksaw Machine. 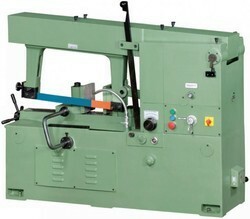 The offered hydraulic hacksaw machine is fine toothed, to cut metal sheets. Our supplied hydraulic hacksaw machines are provided with the continuous hydraulic system, for facilitating the lifting and cutting operations. We are an authentic manufacturer and supplier of Hacksaw Machine. This product is the Hacksaw Machine that has a crosscut saw blade as a cutting member. The cut may be made perpendicular or at the angle to an axis of the blank. Our offered range is widely known for consuming less power, anti corrosive, high efficiency and also ensure continues cutting by means of circular endless blades. Size 8" 10" 12" 14" 16" 18" 20"